I have not kept a journal since I was a boy. I last abandoned these pages during the inverse leg of this very journey, four years ago, when I left the territory to go to school. It is perhaps ironic I kept no written record of these last four years, for when I am withered and old I suspect my time in school is the period in my life I shall look back upon with the most fondness and longing. Instead, errant fool that I am, I have only kept a record of my daily comings and goings when I am at home, mired in the tedium of life in the territory. It should be considered a tremendous irony that I have maintained records of my existence only during periods of my life when it was not worthy of record. This journal is nothing more than an exercise in keeping at bay the stultification and mental weariness I know will come upon me once I return to that world, to the territory, and to time spent with my father. My existence there—all that I shall experience—it is beyond languor, beyond ennui. Life at my father’s home represents nothing less than the atrophy of the mind itself. Not that my father is a wicked man; I wish to impress this fact most sincerely, especially since it is probable that, in her “exploration” of my belongings, my grandmother is likely to uncover this diary and read these passages, and will hasten to share with my father any negative report she finds contained herein. No, my father is a good man, but a hard man, and a plain one—even Grandmomma must confess to that. The trappings of the world I hold most dear—those things that mean the world to me, those things that are my world, that define my world, that define me—they mean nothing to him. And even more painfully, my father has already determined the manner in which the arc of my life will bend, and I, his only son, must dutifully obey. How I wish it were not so! After three years at preparatory school, I had completed but one year of my university studies. Yet I needed just one week—nay, one day, one hour—to know I truly belonged there, in Cambridge, in academe, in amongst those ancient tomes and dusty halls. Feldspar, my one friend at Harvard, used to josh me frequently and oft would say, “Goldsmith, you will lose yourself in the library someday, I guarantee!” And then he would laugh in that short-pitched bark of his, his laugh that always made the other fellows snigger as well. But I did not laugh. Rather, how I longed for what he said to come true. There, in the library, to read and study under the gas-lit lamps for as long as I wished, to be lost amongst the books… Yes, that is where my heart’s desire can be found, as the old poem starts. But what good will it do me? My father has but one son, and when you are the son of Jessum Goldsmith, your lot in life is naught but to obey. “Time to give up the books,” he wrote me, his only letter in the four years I was away from his custody. I had not to read his words at all to know what his communication meant to convey, to know it was a summons, and not the heartfelt correspondence of father to son. “Time to come home. To learn the business. Time to be a man.” All my life I have longed for nothing more than books and words and worlds that unfurl one page at a time. I was meant for academe. I had hoped to complete my baccalaureate and continue straight on, for my post-graduate, for my master’s, and then—my most sincere wish—to teach. To be forever a part of those hallowed halls. What care I for business and industry? But no, I am son to Jessum Goldsmith, richest man in the territory, and I do not have the freedom others of my age and station possess. How I wish I were a second son, or third, a son of lesser value and importance. But Momma died giving birth to me, and since I stole Father’s past, I cannot steal his future as well. “To be a man.” Those words have haunted my existence since I have existed. My father measures manhood in far different ways than the professors I idolized, the masters whose learning captivated me and whose lectures I would listen to in spent and utter rapture. A man of letters, an intellect, someone who wrestles with ideas—to me, that is a man—that defines a man. Milton is a man. Donne. And Jonson and Pope and so many more, and that is just amongst the English. But my father is not a book-learned man, and his idea of what a man should be neither begins nor ends in the printed pages of any text. He was born to the outdoors, and me to the indoors, but rather than simply acknowledge our differences, he only tolerated them until such time as I turned eighteen, when he summoned me home for his tutelage to begin, and for my real “education” to commence. Father’s letter was accompanied by one from Grandmomma, a more faithful correspondent all these years, though, as ever, only a mouthpiece for my father. “You must come home, Nathanial,” she wrote to me. “It is time to plan for the future. It is time to give up your books. Your family needs you. You must come at once.” I could hear the gloat in every word. For so long I had begged to be sent East, to study, first in boarding school, and then at university. Father gave in, I believe, just to quiet me, and because, at such a young age, I held little use for him. But there, in Boston, I could live as I wished, with my books, and in my mind, alone and quite content to be so. I could be literate and educated and revel in such things as befits a learned man. But Grandmomma never saw the need for such lofty education and told me as such in almost every letter she sent. Yes, like the son she bore, she ever wrote in declarations, though that is the usual state of the world in her eye; every letter she sent to me reflected duty, honor, and obligation to my father and his ideals of masculinity, and, of course, to the vaunted Goldsmith name. Vaunted, indeed. I happen to know my Grandfather Goldsmith was a dry goods salesman from Michigan. It was my father, his son, who went into Idaho as a lad and made his fortune in the mines. Our name is no more hallowed than the tradesmen who gave it to us in the first place. A smith, after all, is one who works with precious metals, not one who possesses them. Our name should be a reminder of the humble beginnings of our family and the promise that a man may make his own way in this world. But no, to Grandmomma, to Father, we are the first family of the territory. We own the largest manor; we hold the most land; we possess the most wealth. It is all that matters to them. I suppose I should find it ironic our name is Goldsmith; Father, after all, made his fortune in mining silver. “The Silver Baron of the Western Lands.” That is what they call him in the Eastern newspapers. How oft would I read of his latest coup. And then the other fellows would stand around me and ask, “Is that truly your father, Goldsmith?” As if they did not know. But most of them—Fulton, Hardwicke, Matthews, and the like—all they cared about was money, too. Only Feldspar understood how little it meant to me. Only Feldspar understood that what I cared about was the books, the words, and the ideas contained within. Those were the worlds that meant so much to me. Not money, not industry, and certainly not mining. Just the words. How I longed to be part of that world, to be part of the discourse of scholarship and books and ideas. It is in my disposition to be of that world. It is who I was meant to be. Or so I always believed. But then again, of what consequence are my own beliefs and ideals? I doubt I shall ever see Feldspar again. I had not thought of that until now. I suppose I should feel disconsolate over that but…truly, I feel nothing. Perhaps I am simply resigned to my fate. Perhaps I am incapable of such feelings, or feeling anything but for my books. I have never had many friends, and those I do are such friends of the sort one exchanges pleasantries with, and not the sort one shares one’s innermost confidences and expressions. Even Father, hard man that he is, has Abernathy, his lieutenant, with whom he plots and plans for the future, for the next mine or the next land grab or the next political power play. I have no one. Then again, perhaps I need no one. I fear I do not have any such innermost desires for companionship. All I have ever truly cared about are my books. Well, and, of course, Dora. My sister. Older by a year. A carefree child, though, I suppose, no longer a child. Her letters mean almost as much to me as my tomes. And while I am sure she did not care to receive my surely dull correspondences of what I had been reading and what I had been learning, she always paid attention and always asked her little brother to tell her more. And oh, how she loved to hear of Boston, of the Old North Church and the Quincy Market Hall and the teeming masses of people from all walks of life and corners of the nation—indeed, the world. Oh, she herself never expressed any desire to see it. That is not her way. But at Christmas I would send her etchings I purchased from the booksellers of the sights of the city, and she always wrote that she felt as if she had glimpsed it for herself. Yes, it will be good to see her again, to walk with her amongst the gardens and whisper conspiratorially about Father’s demanding ways. But that does not counterbalance the loss of school. And she will be wed soon, I would wager, and then she will be gone as well. The train is stopping presently, as we are pulling into Chicago. Perhaps I will disembark and stretch my legs. Our family car affords me every luxury and every privacy, but the only other soul I have seen since leaving Boston is Cheevers, our man, and dull sort that he is, he has done nothing but sit in a corner and stare blankly afore, pausing infrequently in his ruminations to serve tea. I asked him, as we pulled out of Philadelphia, what he might be pondering so deeply, but the question seemed to puzzle him most earnestly, so much so that I gave up any hope of an answer. Yes, I think I shall disembark upon Chicago and perhaps converse with a fellow passenger or two, at least to exchange a pleasantry or any news of the journey. And possibly—one can hope—there will be a bookseller at the station. It will be three more days before we reach Boise. And two more after that to home, if the roads are good. Something new to read would gladden my heart indeed. 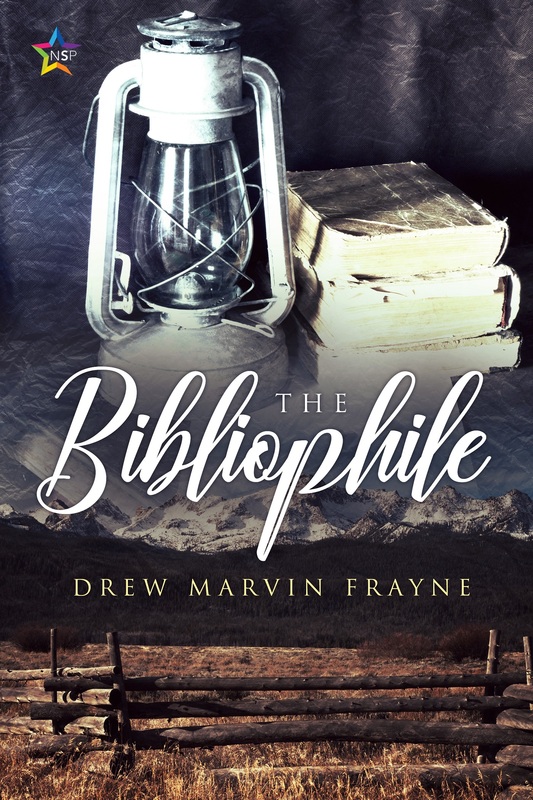 Drew Marvin Frayne is the pen name of a long-time author (Lambda Literary Award finalist) who is finally taking the opportunity to indulge his more sentimental and romantic side. When not writing the author lives with his husband of 20+ years and their dog of 10+ years in a brick home in the Northeast. Find out more about Drew on his Website.